I was looking forward to dinner since its conception in the shower at 7am! There was a 600g pork fillet (solomillo de cerdo) with my name emblazoned across its sinewy flesh waiting for me in the fridge. There was only one thing that I wanted to do to this cut of meat. I removed any excess fat from the fillet as even though I am not anti fat; I am anti-pallid and tasteless food. 1st: Chop fresh sprigs of rosemary to cover the board you are working on. Sprinkle rock salt and crushed black peppercorns and mix on board. 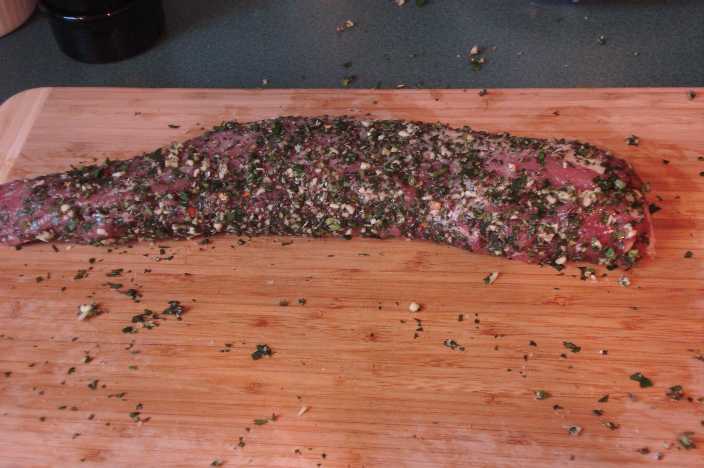 2nd: Once meat is trimmed and primed, roll it around on the chopping board coating all sides in a salty, peppery herby crust. No oil need be added. 3rd: Sear all sides in a very hot dry pan. I suggest opening a window or hitting the extractor fans as with or without oil it tends to smoke like hell!! 4th: Finish cooking in a hot oven. I had decided to serve the fillet with boiled veg but did not fancy having to make any gravy. As with many things that happen in the kitchen, I threw a few things together, to create a delicious jus to pour over the meat before serving. 5th: Whilst I let the meat rest, I heated the cooking juices with some chicken stock, crushed garlic and dry sherry. I added a couple of fresh sprigs of rosemary and reduced the liquid by half. As an optional extra: toast almonds in a dry pan and sprinkle over before serving.